It’s a real tropical oasis growing peppercorns, jasmine, cinnamon, cashew nuts, vanilla, turmeric, jack fruit, lemons and coconuts. Rich in nature the estate is home to monkeys, porcupines, wild boar, peacocks, mongoose, rabbits, wild deer and parrots to name just a few. So remote is the land that the final 2 kilometers is a trip on foot to reach clearings on the edge of the Sri Lankan mountain range. This is as natural as it gets. From the initial seed it takes 10 months before the first harvest, at which point the lemongrass will be around 3 feet tall. 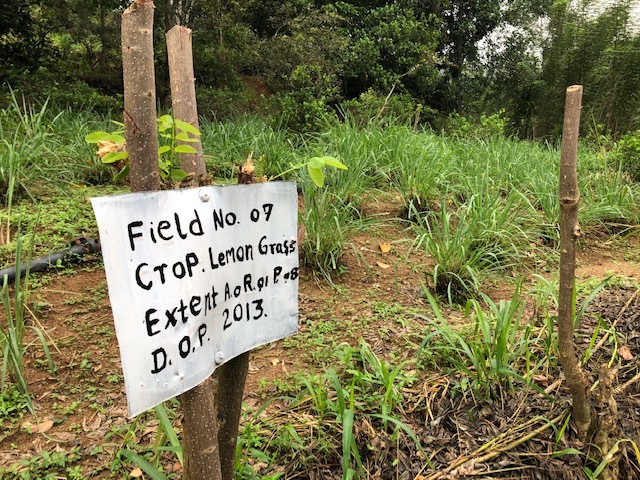 Our lemongrass is grown in mini clearings around the estate to maximise exposure to the sun. Green Gliricidia trees are chopped and layered across the lemongrass plants that naturally fertilise the soil. There is virtually no pests or disease. After the initial harvest the crop yields every 3 months. 3/4000kgs of lemongrass are grown on this estate every year. Once the lemongrass is harvested it’s dried for 3 days on tea withering beds locally before being carefully processed and cut in Colombo. The ginger has long, slim, green leaves which look much like sprouting grass. Within eight to ten months, the ginger plant will be fully grown. This tropical ginger requires full sun and warm temperatures all year round before being dug out of the ground. Again this is processed in Colombo with the Lemongrass before being blended together to create our tea.